Many of us in our childhood weave our own world of imagination with action heroes, intense melodrama and surreal characters. These parallel worlds are mostly figments of imagination but are somewhat derived from realities of the real world, and thus also help us in crusading the actual world. Children mostly derive inspiration from these characters- cartoon heroes or those about which they have read in fantasy books. However, these also have profound influence for some of them even in their adult life. A story with such a premise seems interesting. The author Gautam comes up with such a book “Rafflesia- The banished princess” which details the character Appu’s mentalities in a realistic manner- some of it derived from his favourite fantasy exemplar; and how exterior motives and appearances are guided by interior influences and circumstances which shape an individual. The storyline follows Appu (Apurva Sharma) and his growing up into an introvert guy who pretty much lives in his own world. However, there are various influences during his childhood which make him this socially awkward person who has difficulty striking conversations with people, but that is not the case in his vividly vibrant imagination where he seeks comfort in the surreal world of Rafflesia. When Appu was a child, he received two books as gifts which had a great influence on him. Rafflesia was one of those books and Appu cherished it as a prized possession. Growing up in poverty, Appu has the fantasy character Rafflesia by his side, and his mother Trina, father Aabir, his beloved Thamma and his childhood friend Rahul. In adult life, Appu has an unhappy marriage and the narrative follows how he deals with it and overcomes it. The story also deals with many other aspects of Appu’s life and how he grapples with such situations. 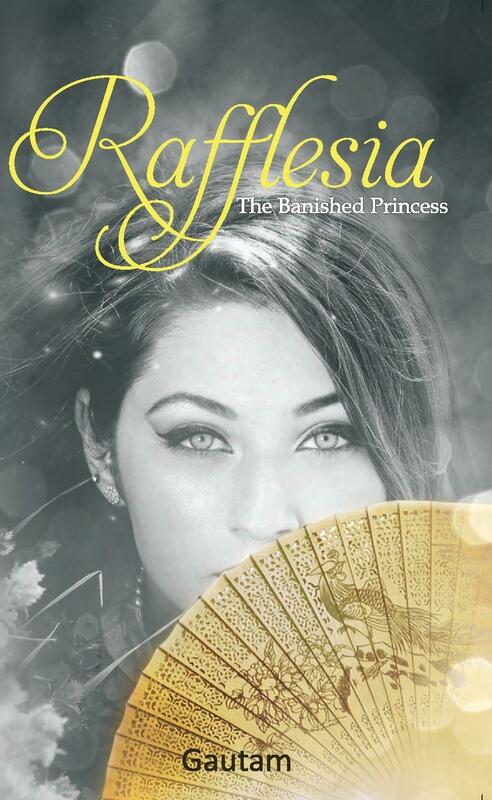 The book cover shows the princess Rafflesia in a gray monochrome, with her face half hidden by a yellow Japanese folding hand fan, which is intricately designed. However this book cover is not that appealing as more colours and vibrant hues would’ve made this cover come to life. Also, thinking this to be a fantasy book, one expects myriad colours imbued in the story as well as the front cover. The blurb at the back cover is well written and lyrical, but again gives the notion that one while reading this book will foray into an imaginative fantasy world, but barring the brief instances where the story of Rafflesia is detailed, this never happens. Regarding the narrative, the story is well-written and the characters are explored in depth. The friendship between Appu and Rahul has many good moments and is written very well, taking cues from contemporary times. Many characters and relationships are shown to be multi-layered. However, the story is slow-paced and the narrative drags somewhat. However, the author has shown his writing prowess in writing a well-thought narrative with ample usage of adorned words and detailing evocative situations very well. This is a book which is a bildungsroman of sorts of the main character, as it deals with Appu growing up and the many influences on his psyche. It is about the mundane details of life of a character that is both interesting and tedious at places, and readers looking for a fantasy story won’t find much of it. However, there is much more in this psychological fiction saga where one will find many hidden meanings in the narrative and the central character’s reasons for doing the things that he does; and an explicitly brewing relationship between the humdrum adult musings and childhood fervent imagination.